2016 Pinot Noir from our Carneros Vineyard. We are proud to announce the release of our 2016 Pinot Noir from our Carneros Vineyard. · Complex aromas that range from Blackberry, Cherry and Ginger. If you would like more information about this topic, please contact Kieu Hoang Winery at 707 253 1615 or email at info@kieuhoangwinery.com." Over 50,000 of our people are in current need. That is half the number of the allowed 100,000 Vietnamese refugees that arrived in the USA in late April 1975. But we were more fortunate then than our people are right now. We lived in a military camp. We had foods to eat daily. How about these people now? Think of it. Some live homeless in one car for an entire family. Others are living in a little hut, like those firemen’s huts that I shared with all of you that firemen from faraway Texas and Washington State used that came to my fight the fires in areas like Westlake and Simi Valley. I will also invite the new governor, the Police Chief of Thousand Oaks, the FBI the District Attorney of Ventura county and the appropriate charitable organization(s) which are responsible to come to join me to receive the donation check to help the Borderline shooting cause. Please help me to fulfill my American dream." * You must be 21 years of age or older to order or receive alcoholic beverages from Kieu Hoang Winery. Receipt of shipments containing alcoholic beverages requires the signature of an adult. Wines purchased from Kieu Hoang Winery are not for resale and are for personal consumption only. ** Subject to Change and on numbers of families participating. ***Due to the positive and successful response from our fans, we will be concluding this campaign early. We are proud to announce the release of our 2017 Rose of Pinot Noir, Napa Valley, CA. 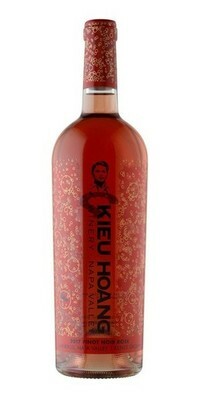 ORDERING Information: You can order your wine online at http://www.kieuhoangwinery.com/Wines or by contacting Kieu Hoang Winery at 707-253-1615. To learn more about our wines and story, please visit our website at www.kieuhoangwinery.com. If you would like more information about this topic, please contact Kieu Hoang Winery at 707-253-1615 or email at info@kieuhoangwinery.com. Enjoying Monday with my friends visiting the winery! California Kieu Hoang Donates $5 Million to San Jose Flood Victims.